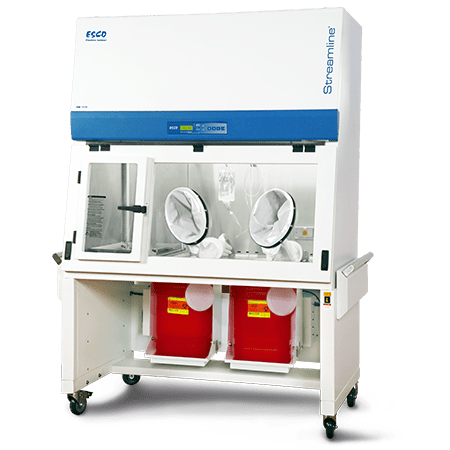 The Streamline® Compounding Aseptic Containment Isolator – Recirculating (SCI-N) is suitable for work involving hazardous drugs that are not known to be volatile. The work zone and pass-thru interchange are under negative pressure to the room in order to maintain containment in case of a breach in the barrier isolation system. ULPA filters with a typical efficiency of 99.999% at 0.1 to 0.3 microns provide superior ISO Class 3 air cleanliness. Work zone and pass-thru interchange are under negative pressure to the room in order to maintain operator protection in case of a breach in the barrier isolation system. Ergonomically angled front and oval glove ports improve reach and comfort. Safe-change cuff rings permit glove changes with zero risk of contaminating the work zone or pharmacy environment. One-piece work zone liner with no crevices is easy to clean. Streamline® Compounding Aseptic Containment Isolators are available as a standard bench top unit. Additional accessories are available for further enhancement.